In Early 2014, Absolon Williams, a former basketball player at the time, was approached by Coach Erik Davis in an attempt to recruit him to try out for the boys' volleyball team. After recently losing in the State Championship Finals the past year and the need to replace Darryl Miller Green, a graduated middle blocker, Davis had taken note of Williams long arms and six foot three inch stature. Davis instantly recognized the early phases of a middle blocking machine. After some deliberation, Williams agreed to give volleyball a try. Within a matter of months, Mojave High School returned to the state championship finals and went on to win its first State Championship over Clark High School. Fast forward to Williams, junior year, “Abso” led the team with 10 kills in a three-set thriller to help the team claim the Legacy Longhorn Invitational Title. Williams and the Rattlers went on to win the state championship once again...and then one more time his senior year. Following Absolon’s third straight state championship title it was time to start thinking about the future regarding his volleyball career. Williams thought he found a good fit at Erskine College in South Carolina which is a NCAA Division II school that competes in the Conference Carolinas. Adjusting to the college game was challenging for Williams because until now he had only been coached by Erik Davis, his high school mentor, friend and coach at Mojave High School. Heading into his junior year of college volleyball Williams felt it was necessary to transfer to a different school. Williams now competes as a Cobra at Coker College, about two hours east of Erskine. “Coach Brubaker is a great program leader...unfortunately, each semester we had a whole new team of freshmen and I needed to go somewhere with more stability with the time I have left to play and I felt Coker could provide that,” said Williams. To his surprise Williams found out he’d be joining the Coker roster alongside rising freshmen and fellow Vegas resident Shaun Kampshoff, the 6-4 left-handed setter from Las Vegas High School and Vegas Xtreme Volleyball Club. The two were shocked to find out they would be competing as Cobras together and although never competing against each other Kampshoff and Williams began hitting open gyms and workouts together in preparation for the season while still in Vegas. Williams is beginning to connect with Kampshoff, creating a strong hitter-setter connection and believes they can be a duo that helps put up a challenging offensive line in the front row for the Coker team. “We had a scrimmage tournament and he was our primary setter and we did phenomenally well together. All that we're doing now is trying to get his fundamental skills up to collegiate standards. His left hand is pretty nasty and still gives me a problem when we play against each other. He will definitely be a strong part of the team the next year….and he works super hard. I guess it is because Vegas creates the best,” said Williams. Moving into Williams’ junior year and the second semester as a Cobra, the future looks bright and we couldn't be more excited to see what is ahead. William wanted to ensure the younger generation of Vegas Volleyball that playing at the next level is closer than it seems and definitely within reach. 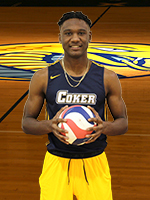 Good luck to Absolon Williams & Shaun Kampshoff and the Coker Cobras play Barton College today in a final season match before heading into the IVA playoff tournament which starts this Friday in Harrogate Tennessee.